Email marketing is still one of the best ways to target your audience and convert sales. There’s plenty of evidence out there to support this. Those are just a few facts. You can read an entire lists of more email marketing facts at www.emailisnotdead.com. For these reasons and more, it is important for you to become a true expert at email marketing. In other words, the better you can master email marketing, the more money it’ll put in your or your company’s pocket. Mastering email marketing is not as hard as you think. All you really have to do is follow some basic ground rules and look at real world examples that can teach you how to become more effective at it. A good example of this is Panda Express. This American Chinese restaurant has mastered the basics of email marketing right in front of your face and you probably never even realized it. It happens every day and they convert like crazy, which is why they continue to do it. Later on, I’ll explain how Panda Express does this, but first let’s cover the basics. Following the basic ground rules of email marketing is very important to ensure you’re doing things correctly. This means that you’ll be setting yourself up for success right from the start, and that alone will increase your chances of conversion. Every email blast starts with the subject line. When the recipient receives an email, this is the first thing they see and read. It’s what makes them either open the email or delete it. For that reason, I consider the subject line to be the most important part of an email blast. What follows is the email itself. The email generally contains a preview or highlighted information regarding your product or service. It can also include a promotion or special that you might be offering. Every email should contain a call to action. A call to action is usually a button that says “Buy Now” or “Learn More”. The call to action needs to tell the recipients exactly what you want them to do next so they can take action immediately. Without it, you will have a hard time identifying your ROI. Once a recipient takes action and clicks on your button or link, it usually takes them to a landing page. The landing page is where you deliver all the details regarding your promotion or special. It could also be a sales page for people who are ready to buy. If you’re looking to generate leads of some sort, this is where you would have a contact form that will help you get leads so you can later follow up and convert. To put it in simple terms, the landing page should be the place where you intend for every email recipient to end up. This is how you will measure what percentage of people who actually click on your link become customers. Your subject line is the most important part of your email blast and the reason is simple: if you can’t write an effective subject line, your open rate will suffer. In other words, if your subject line isn’t very interesting, not very many people will open your email. You’re wasting both your time and money by designing a beautiful email and crafting possibly the best promotion on Earth if no one opens it. A poorly written subject email line can be the difference between making a profit or not. It can be the difference between getting a return on your investment or not. Without an effective subject line, it won’t matter if you’re giving away your house for free because no one will ever know. Learn how to write effective subject lines as soon as possible. Be very specific and clear about what’s inside the email. Tell the recipient exactly what they’re going to see once they open the email. Most importantly, never trick them into opening the email by using a catchy phrase or a deceiving promotion. In the long run, this will hurt your brand more than you think. The minute you use a deceiving subject line, the recipient will immediately categorize you or your company as spam and you’ll lose all credibility for your brand or product. The next time you send another email blast, chances are you might be sent directly to the spam folder. You also run the risk of losing many of your subscribers forever when they hit the unsubscribe button. Try to keep your subject lines to 50 characters or less. If you go longer, part of it may be cut off by recipients’ email clients. But don’t stress about keeping it to exact 50 characters, if you need to go a little longer for clarity’s sake, do it. Make it action-oriented. Use strong action verbs instead of weak adjectives. Make it timely. Limited time, time-sensitive, or date specific emails have very high open rates because a lack of action may equal missing out or loss. Make it obvious. Write the subject line to the recipient knows exactly what the email is about immediately. Avoid words commonly known to negatively affect open rates, like: help, reminder, percent off. Avoid words commonly known to trigger spam filters, like: make money, act now, limited time, test, and free. Avoid setting your subject line in all caps and using exclamation points. Avoid making too good to be true claims. 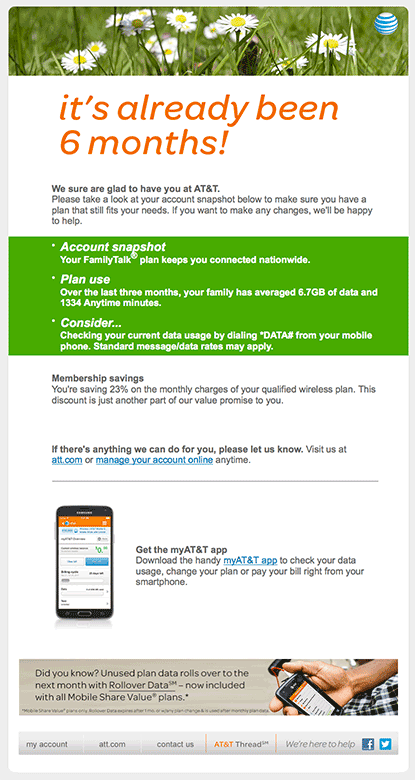 Also, consider running an A/B split test of your subject lines. What this means is that you come up with two different subject lines which stay within the guidelines above. You then send out two emails that are identical in content, the only difference being the subject line. Most major email marketing platforms offer this feature included with your current plan. The big advantage of using this method is that you get concrete evidence of which subject line will help you increase your open rate for every email you send. The way it works is by sending one email with Subject Line A to a small portion to your email subscribers, usually 10% of your list. 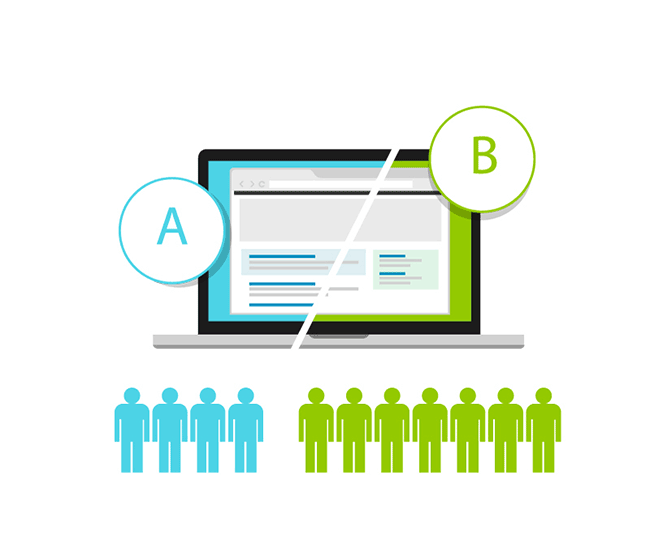 At the same time it sends another email with Subject Line B to another 10% of your list. After a predetermined amount of time, usually 24 hours, it will then send the winner of the two emails to the remaining 80% of your list. In my opinion, this technique should be implemented on every email you send until you become good at writing subject lines and can feel confident you know what you’re doing. Even then, I suggest you always continue to test and tweak. You have nothing to lose. People often ask which type of email is better: html or plain text? On one hand, a plain text email is faster and easier to produce, but on the other hand, an html email looks a lot more professional. In my opinion, the easiest way to choose is to look at the type of company you are. If your company is represented by you, the individual, I believe it is acceptable to write plain text emails as that makes it look a lot more personal. It gives the feeling that you’re talking to the recipient one-on-one as opposed to sending a blast to a broad audience. This type of approach can help you achieve a more intimate relationship with your customers or audience. At the same time, you can save quite a bit of money if you don’t have to spend it paying a designer to build html emails. 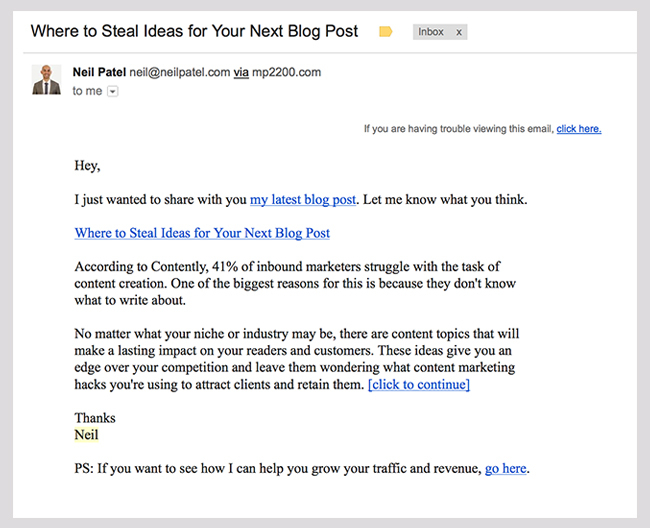 Take for example Neil Patel from neilpatel.com. His emails are primarily plain text, and that’s because he’s the face of his company and makes that very clear by signing his name and sometimes even including a picture of himself. On the other hand, if you’re a Fortune 500 company, or at least want to give the impression that you’re at the same level of the big corporations, you need to invest the money and time to create professional-looking html email designs. Yes, they’re costly and require a real professional that cannot only design them but also translate them in html. As you may have noticed, both email styles have a completely different look and feel to them. At the same time, there are advantages and disadvantages to both. Again, if you’re trying to compete against big corporations or at the very least want to position your company at the same level of professionalism, I suggest you opt for html emails. If you’re trying to provide content to your customers on a more personal level, and if your face also represents your brand or company, then go for plain text. How Frequently Should You Send Email Blasts to Your Subscribers? You should try to only send out email blasts about once a week unless you have a segmented list of subscribers and can send out mini-campaigns targeted to only those people based on their specific interests. In the case of the latter, two per week should be the maximum amount of emails sent out to the same subscriber. If you do more than that, you run the risk of having people unsubscribe from your list. At the same time, if you don’t email frequently enough, you won’t be able to develop a close relationship with your audience and it can become difficult to close a sale or generate warm leads later. Experiment and find a balance. 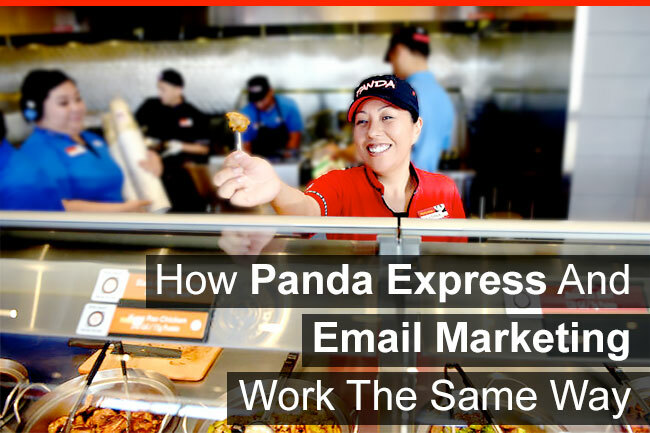 OK, by now you’re probably dying to know how Panda Express and email marketing are the same. It’s actually very simple. The next time you’re at a food court and there’s a Panda Express, you’ll even be able to see it in action. Panda Express usually has a lady who asks every person who walks by a simple question: “Do you want orange chicken?” That question is the same as your email’s subject line and it’s great. Notice how it’s simple and to the point. The minute you say “yes”, she hands you a piece of delicious orange chicken on a toothpick. This means that she delivered exactly what she promised—she didn’t hand you a piece of broccoli on a toothpick instead. If that happened, you would probably get mad and walk away, right? That’s the importance of being simple and to the point when you write email subject lines. You then proceed to eat that sample, and it’s so good that you take action and get in line to buy a 2-entree plate which includes some of that orange chicken. This is exactly what happens when a person opens an email and the content inside matches exactly what the subject line said it would be about. They take action and click on the button that takes them to the landing page. When you finally make it to the front of the line, you complete your purchase and happily walk away to devour your meal. Ladies and gentlemen, that’s a happy customer! You get the idea. The reason this is so successful is because the customer was never deceived. Everything was clear from the beginning and the customer got exactly what was promised. If you can do exactly this with your email campaigns, you will continue to have satisfied customers who will be happy to come back and buy more from you. In short, always be clear about what you’re selling, and in return you will only get customers who are looking to buy. Did I miss anything or have additional questions? Reach out to me and let me know on Twitter or Instagram.